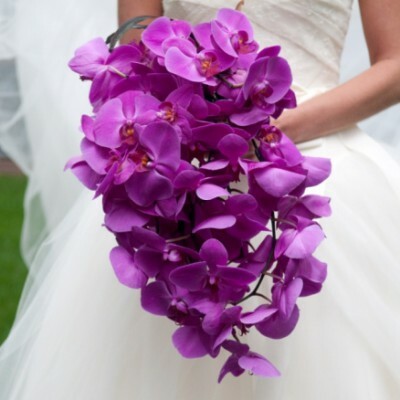 Purple is a marvelous color for wedding flowers. It can range from the palest lavender to a bright purple to a royal eggplant shade, and a huge variety of flowers are available in purple. From centerpieces to bouquets to flower girls, these are some of the prettiest purple wedding flowers. No conversation about wedding flowers would be complete without mention of roses. They are the most popular flower for weddings, and make wonderful additions to all of your floral arrangements for the ceremony and the reception. Roses can range in color from a cool and elegant lilac to a brighter passionate purple. The roses in the purple and lilac family also tend to be among the most fragrant. The various shades intermix very nicely for bouquets and centerpieces with a nice depth of purple color. 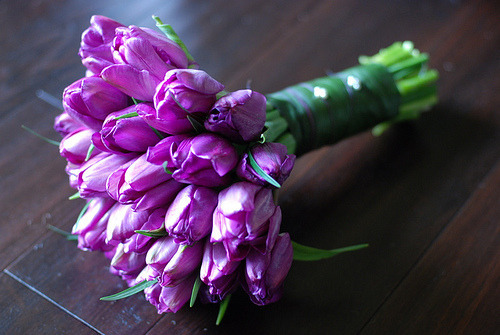 Tulips are another very popular wedding flower that can be found in purple. Whether your preference is the classic Dutch tulip or the baroque parrot tulip, purple tulips are fantastic for a wedding from the winter months into the summer. For the most drama, choose tulips in a dark inky purple that borders on black. They would be a sophisticated accent for an evening wedding, and pair nicely with other striking accessories, such as wedding jewelry that is handmade from dark purple crystals. If your style is old fashioned or vintage, you will have some lovely purple wedding flowers from which to choose. One of the prettiest is the charming look of a big bouquet of ruffly sweetpeas. You couldn't find a more delightful bouquet for a spring wedding. Another wonderful flower with a vintage flair is stocks, which comes in several shades of purple. Multiple blossoms grow along one tall stem, making stocks an excellent addition to centerpieces or ceremony arrangements, much in the same way that florists use gladioli for height. Some brides love sophisticated and glamorous wedding details, from their handmade wedding jewelry to their letterpress wedding invitations to their unique and stylish bouquets. 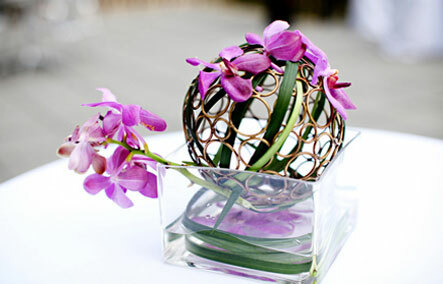 If this sounds like you, then you will adore the look of exotic orchids. Phalaenopsis orchids come in a rich medium purple, and unique Vanda orchids are a dark purple with white accents. Either looks fantastic in a dramatic flowing bouquet, and used in the centerpieces as well. Another great option is purple mini calla lilies. They work beautifully for bouquets with a single type of flower, and the small size of mini callas also makes them a natural addition to mixed flower wedding centerpieces and bouquets. Speaking of small, one of the most darling purple wedding flowers is muscari, which is also called grape hyacinth, due to the fact that it resembles a small bunch of purple grapes. 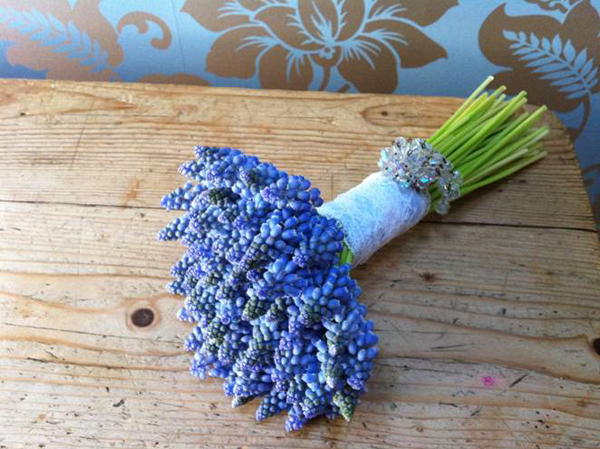 Muscari can be used to add texture and variety to wedding arrangements that feature a range of purple flowers. It is also a lovely choice for creating flower girl wreaths and bouquets for a spring wedding. There are still more gorgeous purple flowers! Bright anemones add cheer and color to winter weddings, while foxgloves and pansies are charming for spring weddings. Whatever the style of your wedding, and whatever the season, purple flowers can add immense style and beauty. Purple is the color. And really it is charming one which makes the decorations more appealing. Got to know about many Chicago wedding venues and planning to hire one for my sister's pre wedding dinner. Arrangements will be all sober but high rated. Quality dinner will be done with mixed variety of snacks. Soups and beverages will be served with starters.